If you’re reading this, affiliate marketing is probably one of those techniques you’ve heard of but haven’t explored. After all, it’s difficult to know where to start. How do you find all those people to make referrals, promote your products, and drive traffic your way? Fortunately, affiliate marketing is not as intimidating as it sounds. Once you’ve chosen the right tools, you can get a program off the ground quickly. Then, you should start seeing the increase in website traffic you’ve been hoping for – as well as an improvement to those all-important conversions. In this article, we’ll introduce affiliate marketing in more detail. We’ll explain what it is, why you should be using it, and how to get started. Let’s get going! Affiliate marketing enables you to promote your products or services via affiliates – members of the public who promote your brand online and receive commissions based on the sales they generate. For example, let’s say you offer online support and maintenance for WordPress businesses. An affiliate tech professional or WordPress blogger could talk up your services through a blog post or comment, and post a unique link to your site. If a potential customer were to click on that link and make a purchase, you’d pay a cut to the affiliate – while keeping the rest of the profit generated. What if you don’t know any of these online movers and shakers, or you don’t have time to pursue them? That’s not a problem, since there are ways to help them find you. All you have to do is make your business an attractive prospect for affiliates – but we’ll get to that shortly. If you haven’t yet tried out affiliate marketing, now is the time to start. 81% of online brands were using affiliate programs at the end of 2017, and “affiliate marketing” as a search term continues to grow. Even better, the costs of affiliate marketing are low: 62% lower, in fact, than traditional marketing. In return, you can see up to triple the amount of leads. What’s more, even at the end of 2016, affiliate marketers were reporting a 45% increase in new customers. It gets around ad blockers. The advent of ad blocking was a disaster for online marketing, as company ads were cut off before they even had a chance to reach their audiences. Affiliate marketing has changed that, seamlessly integrating advertising into online content of all varieties. It’s relatively hands-off. Once you set up your affiliate marketing program, the affiliates will do most of the work for you – and they’re continually motivated to do so by the commissions they recieve. Of course, you will need to keep an eye on their progress, manage your affiliate network, and update your strategy regularly (if you want to achieve the best returns). It actually works. Requiring just a little time and effort, affiliate marketing is one of the best ways of attracting new customers to your business. Plus, judging from the continued growth of the industry, it’s here to stay. Ultimately, there are a lot of upsides to affiliate marketing, and very few downsides. Most importantly, it’s a low-risk venture, costing you little to try it out. Let’s take a look at how you can get started. When it comes to setting up an affiliate marketing program, WordPress is the perfect platform. You can use a new or existing site to handle just about all of the work involved. As for how this works in a practical sense, the answer is (as usual): “There’s a plugin for that”. There are many affiliate marketing plugins available for WordPress sites, which integrate smoothly and add key features. Now, let’s look at what you’ll need to get started with affiliate marketing. First, it’s a good idea to back up your WordPress site – this is vital whenever installing new plugins. Then, you can get to work! As we mentioned, you’ll need a dedicated tool in order to add affiliate marketing functionality to your site. Each business is different, of course, so choosing the right affiliate manager is important. Feature-heavy and user-friendly, this plugin integrates seamlessly with popular WordPress plugins such as WooCommerce. The entry-level package is $99 per year, and the Professional option will set you back $249. In particular, its easy affiliate approvals feature is very useful. This plugin offers an easy setup, with perks such as members-only training. The Merchant Edition costs $85 for use with one website, while the Developer Edition provides unlimited website licenses for $165. These are both one-off fees, making Affiliate Royale a cost-effective option for those dipping their toes into affiliate marketing. Despite that fact, it still provides a lot of vital features. These include easy installation and tracking, an affiliate portal, and a range of other useful, customisable elements that make it an excellent service for startups and small sites. There are also paid plans available if you want more support or additional licenses. Once you’ve chosen an affiliate manager plugin, you simply need use it to set up your program. How you do this will obviously depend on which tool you select. However, let’s take a quick look at Affiliates Manager as an example. You can add affiliates using the New Affiliate tab, and manage your existing members through My Affiliates. 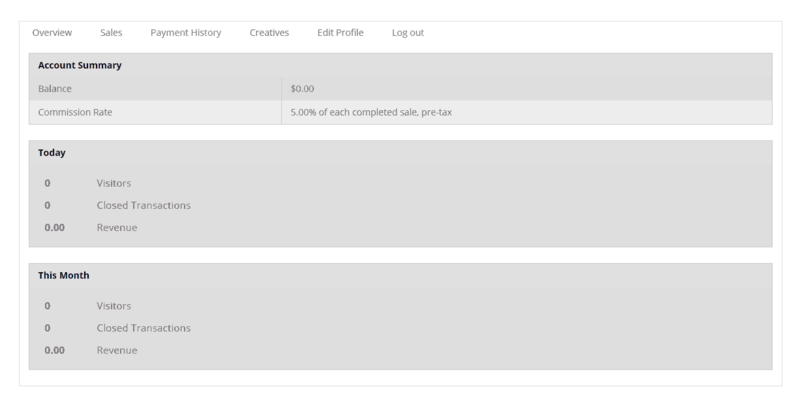 Plus, you can use the My Creatives section to provide your affiliates with promotional ad banners and text links. Most of your affiliate program’s other key functionality is added to your site automatically. The plugin will create important pages for you, such as a home page, registration page, and login page. All you have to do is customize them if you want (under Pages). As you can see, getting your program set up is generally a quick process. If you need more help, however, you can always check out your chosen plugin’s documentation. Once you’ve set up your affiliate plugin, it’s time to find some affiliates! The easiest way to do that is to join one or more affiliate networks. These connect you with potential affiliates, acting as a third party. On the very popular ClickBank, for example, you’ll sign up and post your products or services in a marketplace. Affiliates will then take their pick, according to their niche and the quality of your offer. Commission. Think carefully about what sort of commissions you wish to offer. It might be smart to offer high commissions at first, to get the ball rolling. Affiliates are more likely to promote products that offer commissions between 50% and 75%. Listing copy. The best way to attract affiliates’ attention is with strong copy. Mention your program’s conversion rates, the benefits of the product or service, and whether it’s a ‘hot’ niche. Transparency and clarity. Make sure that you give your potential affiliates the full story about what you do, how you do it, and what you can offer them. Extras and perks. It’s also a good idea to provide your affiliates with a few things to make their lives easier. So ensure that your ads (or ‘creatives’, as they’re often called) are written up and ready to go, along with testimonials, useful keywords, and excellent support and resources. In addition to affiliate networks, you can start recruiting on social media, in forums, and even through paid advertising. Just keep the above points in mind for all your posts, tweets, and ads. It’s also useful to optimize your site’s content for search engines, in order to attract affiliates by way of organic traffic. Affiliate marketing is a hugely lucrative industry, and a worthwhile investment for many businesses. Embracing affiliate marketing can give you the edge on your competitors in terms of exposure, traffic, and conversions. Plus, as a WordPress-hosted site, you’ll benefit from user-friendly tools that can help you streamline the affiliate marketing process. Choose an affiliate manager plugin. Set up your affiliate program. Do you have any questions about how to use affiliate marketing on your WordPress site? Let us know in the comments section below!